With the launch of NSW: Strong, smart and connected, the NSW Government established Defence NSW as a dedicated team within the Department of Industry. being inclusive of key stakeholders in the NSW defence sector. 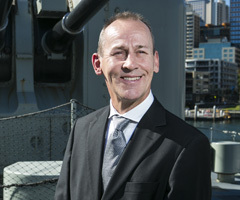 Commodore Peter Scott, CSC, RANR is the Director of Defence NSW, a compact, dedicated team recently formed within the Department of Industry to execute the NSW Government Defence and Industry Strategy - Strong, Smart and Connected. Commodore Scott is a highly regarded military officer who recently retired from full time naval service after a distinguished career of more than 34 years that included multiple command appointments at sea and ashore. His operational service included numerous Special Operations with the Submarine Arm as well as active service in Iraq, the Persian Gulf and Afghanistan. As Director General Submarines from 2013, Commodore Scott led Navy’s efforts in the highly successful Submarine Enterprise over a period of unprecedented expansion and exceptional performance in acquisition, sustainment and operations. Peter Scott joined the Royal Australian Navy as a Midshipman in 1983. Specialising as a seaman officer and submariner, he served in command of HMA Submarines Collins and Dechaineux between 1998 and 2003. Other Command appointments have included service as Commander of the Submarine Task Group, Commander of the Surface Task Group, and the inaugural Commander of the Australian Maritime Warfare Centre. He is a graduate of the Royal Australian Naval College, the Queensland University of Technology, the National Security College, and the University of New South Wales, where he holds a bachelor degree and a Masters in Strategy and Management. Commodore Scott’s operational service includes multiple Special Operations with the Submarine Arm as well as active service in Iraq, the Persian Gulf and Afghanistan during 2006 and 2007. He was awarded a Commendation for Distinguished Service in the Australia Day Honours List 2008, having previously been decorated with the Conspicuous Service Cross for achievements in command of HMAS Collins. Between 2013 and 2017, Commodore Scott served as Director General Submarines in Navy Strategic Command and as Head of the Submarine Profession. 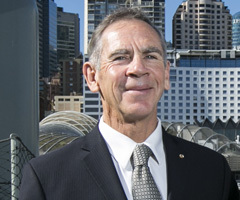 Air Marshal (Ret) John Harvey AM, was appointed as Defence Advocate for NSW in May 2016 and is a retired Air Marshal in the Royal Australian Air Force (RAAF). Air Marshal (Ret) Harvey's Australian Defence Force career spanned more than 30 years, with early emphasis on employment as a navigator and weapons officer in Canberra and F-111 aircraft and later in more diverse roles such as technical intelligence, military strategy, visiting Fellow Strategic and Defence Studies Centre at the Australian National University, instructor at the Australian Defence College and Defence Attaché Southern Europe. He has had extensive experience in the Defence capability development process in his appointments as Air Warfare Adviser within Force Development and Analysis, Director General Aerospace Development, Director General New Air Combat Capability, and Program Manager New Air Combat Capability (NACC) within the then Defence Materiel Organisation. On 26 January 2008 (Australia Day Honours), he was appointed Member of the Order of Australia (Military division) for “exceptional service to the Australian Defence Force and Royal Australian Air Force” in that role. In October 2010, John was promoted to the rank of Air Marshal and appointed as Chief Capability Development Group (CCDG) with responsibility for requirements development and obtaining government approval for approximately 200 projects with a total value of approximately $200 billion. Roles required in that position included; Chair of the Defence Capability Committee, Chair of the Options Review Committee, and member of the Defence Capability & Investment Committee and the Defence Committee. Since retiring from the RAAF in 2012, John has completed a PhD in Computer Science at the UNSW (Canberra) and is currently providing aerospace and defence advice to the Department of Defence as a Reserve Officer. He has led a number of Australian industry delegations overseas (including to the US, UK, France, Italy, Singapore, Malaysia and the UAE) and conducted a review of Priority Industry Capabilities for the [then] DMO. John was a member of the Reference Group for the Board of Airservices Australia and has provided consulting support to KPMG, Jacobs, QinetiQ and ICCPM.